You are a leader in some area and leadership is overwhelming. Have you ever felt overwhelmed by what you have to do? As a parent I remember experiencing this feeling the first time I brought our son home from the hospital. I instantly loved the little guy with every molecule in my body, but as I considered the challenge of feeding, clothing, and parenting that child for the next 21 years, that staggering responsibility made me felt completely inadequate. I could not conceive of how I was going to find the parental wisdom and patience and energy and money get this all-important job done. And trying to take care of his newborn’s needs on 4 hours sleep a night only magnified this feeling. Maybe there have been times when your job has made you feel overwhelmed. The constant work, the late hours, the business trips, the ever-increasing demands, all this combined to make you feel like you’re drowning. Maybe you’ve felt overwhelmed by your finances. No matter how carefully you budget, the bills always threaten to overwhelm your income. And it seems like only a matter of time before you will begin to lose ground. As a student you feel overwhelmed as you face final exams. That week-long pile of huge, make-it-or-break-it tests can feel like a tidal wave that towers over you. You don’t know how you are possibly going to cram enough information into your head and keep it there long enough to get the grade you need. I could go on and on because life is indeed full of things that can make us feel overwhelmed-parenting, career, finances, difficult relationships, health issues, the list is almost endless. And if you can relate, then you can relate to a book of the Bible that deals with a man who I believe experienced this feeling in the incident that is recorded in today’s text. His name is Joshua and we can learn from his example. Whichever word you want to use, Joshua was it. Why me? What if I fail? Do I have what it takes? I believe God gives the answers to each of these questions. Why me? I can have courage because God has called me. The spouse you have, the kids you have, the job you have the place where you live, the relative you have all these have been given to you by God. I believe that God brought me my wife Niki. If I ask “why me?” the better question would be “why not me?” Will I step up to love, serve and commit myself to Niki or do I want someone else to? Do I want to parent my three children or do I want the state to? Do I want to do my job or do I want someone else to? You are on this planet at this moment to do what God placed you here to do, but God knew that you were to best person for the job he gave you. What if I fail? Honestly, we will. We are human, but to be as successful as we possibly can God will equip us. I can have courage because God equips me. In other words, Joshua’s strength for the task he faced would come from the written Word of God. He would get the power and the courage and the guidance necessary for dealing with the overwhelming responsibilities that faced him every morning by reading, studying, and believing its promises. The precepts and principles found in “The Book of Law” would give him the wisdom he needed to get this job done. Now, of course Joshua didn’t have our Bible-most of it had not been written yet-but he did have the first five books of the Old Testament. Most Biblical scholars believe the entire five Books of Moses-Genesis through Deuteronomy-comprised this the “book of Law” that is referenced in verse 8. You see, during the years of his leadership, Moses had kept a written record of God’s words and acts. Deuteronomy 31:9 tells us he had committed this record to the care of the priests. And please note it wasn’t enough for the priests to carry and guard this precious book. No, Joshua was to take time to read it daily and make it a part of his inner person by meditating on it. And to deal with our own times of fear we need to do the same thing. Did I follow the word of God? The last question we often ask as leaders is, “Do I have what it takes?” The answer is, “probably not”, but that’s ok. However, I do have what it takes because God is with me! I can have courage because God is with me. God promises to be with us! The Bible is so full of God’s promises, that it is not really possible to count them. Some people have tried and come up with about 3000. Others have counted 7000. Herbert Lockyer wrote a book called All the promises of the Bible and claims to list 8000. Do you know what the most frequent promise in the Bible? “I will be with you.” See Psalm 23:4, Psalm 139:8, Matthew 28:20, Genesis 28:15, Hebrews 13:5, Deuteronomy 31:6 to name a few! In good times, in bad times, in pleasure, in pain, at the side of the hospital bed or casket God is with us. In parenting, in marriage in our job in hobbies, at the highest mountain or the depths of the sea God is with us! I can have courage because God called me, God equips me with His Word and God is with me! You can have courage too. 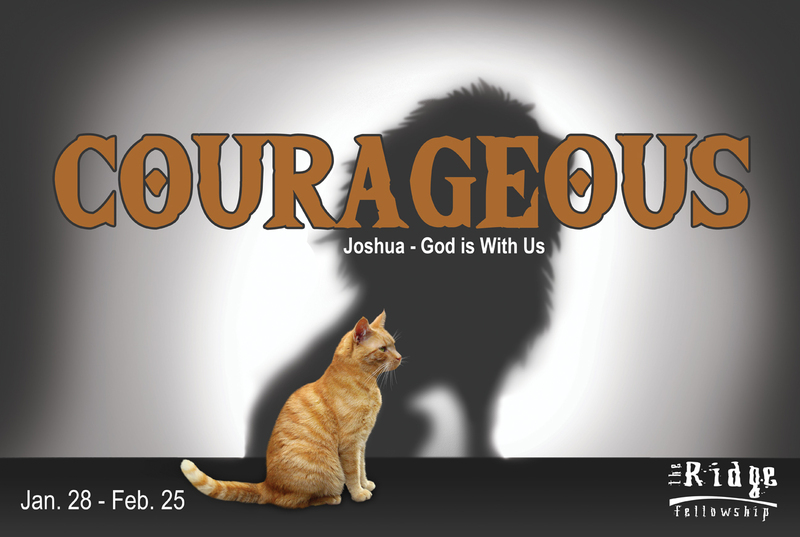 This entry was posted in Courageous (Joshua) and tagged courageous, discouragement, Fear, God is with me, God is with us, Joshua, marriage, parenting. Bookmark the permalink.